Buy a Tutorial Video here! Priority Mail (typically two days in the continental U.S.) assures quick delivery! Thomas Baker receives many e-mails from art students and aspiring painters asking his advice on how to paint traditional paintings realistically. However, it is practically impossible to teach art by e-mail, and trying to do so only wastes the time of everyone involved. Baker has put some video tutorials (How to Use Glazing, How to Paint Hair, etc.) up on YouTube as samples, but the longer viewing times and higher quality available on DVDs make the latter a much better teaching format. Baker is now creating a series of tutorial videos on DVD. In these videos he distills the knowledge he has gained from years of historical research into traditional methods of painting, knowledge developed over centuries of Western tradition, plus more years of personal experience in applying this knowledge to his own canvases, as seen througout this website. These tutorial videos, two hours in length each, feature practical, hands-on demonstrations. The series begins with a DVD about how to make your own canvases to paint on, followed by a second one showing how to use color in a painting. Soon to come are tutorials about portrait a and figure painting. Sign up to be notified when future videos become available. (NOTE: These DVDs use the NTSC video format, which is standard in the U.S. and Japan. If you intend to play this DVD on a video player instead of a computer, and you are outside the U.S., make sure that your video player or TV can play the NTSC format. European equipment that only plays the PAL format will not play these DVDs. Don't buy one of these DVDs until you find out whether your video player can handle American NTSC video! How to use color in oil painting! Make your own canvases to paint on! Content still being added; available soon! The colors you choose can make or break your painting, and this two-hour video lays out all the strategies for achieving success, illustrated with examples from the great paintings and painters of history. This instruction is for the practical painter, the person who wants to create beautiful, realistic paintings without having to first wade through hours of useless scientific color theory. This is a video for painters, not physicists. Only color theory that relates directly to painting is covered in this DVD. What colors of oil paint do you really need, and just as important, which colors do you NOT need? Common color mistakes made by painters. The Color Wheel and how to use it. The importance of colorful grays and complementary colors in painting. Color charts: how to make color charts that will instantly show you how to achieve practically any color you could ever want in a painting. This is possible because, in the process of making your charts, you will create just about every possible color mixture you can get from your paints. After that, whenever you need a certain color in a painting, all you have to do is locate that color on your charts and note how it was mixed. Never again will you waste mountains of paint and hours of time trying to get just the color you want. Banish color-mixing frustration forever! In this video Thomas Baker demonstrates step-by-step how to create the charts and hang them on the wall of your studio for constant reference. These charts will be the most useful thing in your studio. Oil paints, what they are made of, and how it affects the colors they produce. The differences between high-quality and "student-quality" paints. How to choose permanent colors that will not fade over time. The limitations of trying to replicate the effects of light with paint, and strategies for overcoming these limitations. How to mix and apply paints in ways that increase their luminous qualities, and avoid creating "mud" as so many beginners do. Painting textures. How the light or heavy application of paint and texture can affect color. Color contrasts and color harmonies. How to achieve a balance of warm and cool colors in a painting, so that your painting is neither too "hot" nor too "cold." How to choose colors that achieve the emotional response you want in a viewer of your painting. What color harmonies were most often chosen by the greatest painters of history. How to mix realistic skin colors for portraits and figure painting, and how to depict skin in both light and shadow. How to effectively paint clothing, and use complementary colors in the lights and shadows of the drapery. Constrast between light and dark--how to strike a pleasing balance between the two. High and low-key paintings. Backgrounds in paintings. How to create effective backgrounds that do not detract or distract from the main focus of the painting. Best colors to use in backgrounds, illustrated by backgrounds in famous paintings. Palettes of the famous artists. What colors did Renoir use? Rembrandt? Sargent? How your choice of colors affects your paintings. 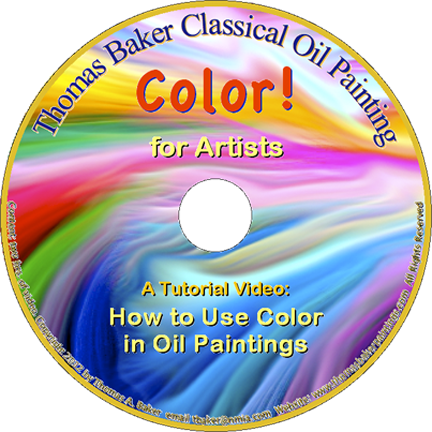 All the instruction is demonstrated in the simple, easy to understand maner that has made Thomas Baker a favorite art teacher to thousands of students of oil painting (See YouTube samples). Brand new, on DVD! Thomas Baker's lively tutorial video on canvas stretching! Not (always) boring! Thomas Baker attempts to make canvas stretching fun! And fails! (A chore is a chore, after all). Yet this tutorial, if not exciting, is at least interesting: along with the demonstrations, paintings come to life and anatomical skulls in the studio speak as Thomas Baker wittily imparts to you the age-old skills of canvas stretching. And as a bonus, he teaches you the history of realist art down through the ages, illustrated by his own forgeries--make that extremely accurate copies--of ancient and historic paintings, culminating in a discussion of how canvas came to be favored as a support for painting, replacing wooden panels about 500 years ago. This entertaining video teaches an artist how to quickly make his or her own traditional-style canvases to paint on, saving time and money, and providing superior-quality canvases in any size the artist requires. The DVD contains nearly two hours (1 hr. 58 minutes, to be exact) of video, packed with how-to demonstrations, covering all aspects of how to make your own canvases, in any size, standard or custom. Price: only $22.50 (continental USA only), with shipping free! Fast delivery by Priority Mail (usually two days), with the DVD shipped in its own jewel case inside a padded envelope. NTSC (United States and Japan) format only. Introduction (20 min): Baker discusses the history of classical realist painting, and shows examples of important paintings from the past, beginning with the 20,000-year-old cave paintings of Europe, through the ancient classical civilizations (Crete, Egypt, Greece, Rome), and thence through the great painting masters of the Renaissance to the present day. This leads into a discussion of the history of canvas as a support for painting. Part One (29.5 min): Tools for Canvas Stretching. All necessary tools, as well as optional but helpful ones, are shown and listed, and then demonstrated. Different tool choices, such as tacks vs. staples, the many kinds of staple guns, and the different kinds of canvas pliers are shown, as well as how to make your own canvas pliers. Tools and techniques for removing tacks and staples are shown. Part Two (7 min): A comparison of canvas types (cotton and linen), their differences, advantages and disadvantages, durability and archival qualities, and how to choose the best type for your purposes. Part Three (23.5 min.) How to build stretcher frames. Where to get the wooden frame parts, and how to assemble and square up the frame and prepare it for having canvas stretched over it. How to use keys to tighten slack canvas, and the dangers of doing it this way, as well as the inadvisability of trying to shrink out wrinkles in canvas with water spray. Part Four (39 min.) How to attach the canvas to the frame. Cutting out the canvas from a roll is demonstrated, followed by an animated diagram of the stapling or tacking sequence, and finally a complete staple-by-staple demonstration of how to stretch and attach the canvas to the frame, including corner folding and fastening down loose canvas behind. Occasional Tom-foolery livens up the demonstrations when screaming things fly out of Pandora's box, paintings somewhat come to life, and an anatomical skull in the studio comments on the proceedings and eats candy. This is the first of several art tutorials to be produced by Thomas Baker. Watch here for others in the future.